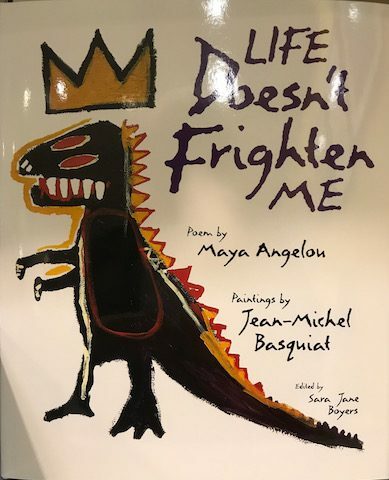 I was very struck with this book jacket when I saw it at the recently opened Basquiat Exhibition at Tate Modern. Too many people live their life in fear. So whatis holding you back? Is it issues with confidence and self esteem. Fear looms up. paralysis zooms in and we don’t do the very thing that we know we want to do. The very thing that will make us happy and fulfilled. But we know more than we think we do. And we can do more than we think we can. I lived my working life in fear. Pushing myself to do things that were out of my comfort zone, but I was working, you had to bring in the story. I don’t want to live in fear now. First, I had a good look at my confidence and self esteem issues. Then I began to address the fear. I think the fear is part of me and in me and yet there is another part that is daring, wants to have fun, do new things, and to learn and to grow. I kindof ask the fear to step aside. I acknowledge that it is trying to keep me safe. It does not want me to fail. But we agree that I will not grow or fulfill myself without doing it. And guess what, we both survive to tell the tale. And so will you. Good luck. And say to yourself Life doesn’t frighten me.